Who's ever heard of such a thing? It was a set of blue rain-coated LIAT travellers who stepped out onto the tarmac to board 361 destined to Dominica in the pouring rain at 6 in the morning. Yes, 6a.m. Morning flights are very early in the eastern Caribbean! So be prepared to be up and out real early. Hitting the road by 4.30 to reach in time. With an hour long plus winding trail of a road to reach capital Roseau It's essential to be on that first flight if you want to be on time for early meetings. What a whirlwind of a day - meetings, meetings, meetings, radio interview, TV appearance and sight seeing in between. 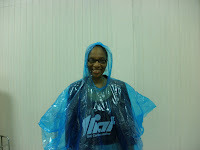 The blue rain coat came in very handy in Dominica also....more rain. What's going on here? This is the Caribbean, and, to prove it, two cruise ships where in port. Rain or no rain,tourists swarmed the capital taking up every inch of space available. Early departure again tomorrow morning. Wish us luck. 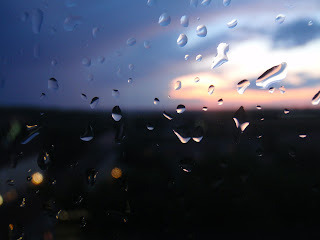 No more rain please.